Size: about 18cm. Material: PVC. color: your selection. You can go ahead and check out price with. Real color may slightly different from pictures due to computer screen's resolution, brightness, contrast etc. Under normal temperature, the mug is black. When pour hot beverage above 50 degrees, the patterns show out. Material: ceramic. It is a great gift for your lover, family or friends. Color: as picture shows. Condition: new in box. version: china.ver. Preowned One Piece king of artist Portgas D Ace II Marine version in very good condition but there are some yellow marks on the back of his jacket Comes with stand and box which will be flattened to save delivery costs WARNING - European buyers may have to pay customs which I will not be responsible for!!! By Banpresto. Includes interchangeable head. Roronoa Zoro. 5/ I do not want to swap your stuff. 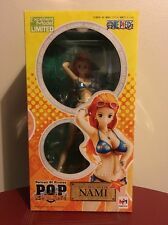 Bandai Product Code: 84340. 13.5cm high. Perfect gift for kids who want to cosplay One Piece. Ideal for cosplay party. We will do our best to help you to resolve your problems. LED Zoro Kokujô Ôtatsumaki 30cm Total Combined Height. 1 x Zoro, 13cm tall (crouched) 14cm depth. It attaches to a custom stand which is attached to the base. 1 x Base Stand. One Piece Anime Begging Zoro Figure. Rare Piece. This collators item has only been used for a display piece in a smoke/pet free house and is in great condition. NEW Excellent Model LIMITED P.O.P One Piece Sailing Again Monkey D. Condition is New. Dispatched with eBay delivery – Shutl 1 day. Collectors item that I purchased in Dubai from a popular Anime store 2 years ago. Unopened ever since because I didn’t want to lower the value of the item. Having a clear out and hoping for a buyer that can find Monkey D Luffy a new home as part of there collection. Thank you! Packaging will be generous so the item will not be damaged on delivery. Perfect for couples who love One Piece, this set compromises of two necklaces which fit together perfectly and allow you and your significant other to be together, wherever you are. The possibilities are truly endless. We will try our best to give y ou a happy shpping experience. Material: PVC Size:about 26cm high. Condition just like it was out of the box. Original box included.